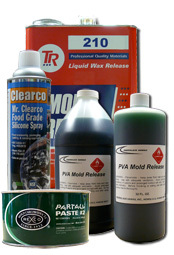 Fiberglass Hawaii Release Agents are used to provide non-stick surfaces for a variety of mold making requirements. Clearco Silicone Spray (food grade approved) High Performance Silicone Spray is an ultra-dry silicone that is formulated specifically for the Injection Molding & Thermo-Plastic Industries. Its spray pattern is super-atomized to coat entire mold areas, allowing for easy release of all thermo plastic materials from the mold and less wasted parts due to deformity. It improves molding efficiency in many processes including injection, compression, transfer, and vacuum form, pour cast, die cast, and extrusion molding. HP Silicone Spray is effective on the following materials: ABS, Nylon, Polypropylene, PPO, Rubber, Polystyrene, Polycarbonate, ABS, Acetal, Polyester, Polysufone, and Polyethylene. Special features include no chlorinated solvents (CFC's), it is non-flammable, quick-drying and odorless. Available in 13 oz. container. PVA is a water/alcohol-based non-hazardous, low voc Polyvinyl Alcohol (PVA) solution of water-soluble, film forming materials. It is particularly recommended as a parting agent for separation between polyester or epoxy resins and various mold surfaces. PVA will not shrink or pull away from corners or curved surfaces. Film parts easily from mold surface and is readily dissolved from molded parts and spray equipment with water. Various Fiberglass Hawaii Release Agents may be used for a variety of different mold making purposes and with a wide range of materials. These release agents may be used with polyester, vinyl ester, and epoxy resins.